FOXBOROUGH, Mass. — The crowd goes wild. Tom Brady stays calm. “That’s pretty much always been a trademark of Tom,” New England Patriots coach Bill Belichick says. Long before he became one of the NFL’s greatest quarterbacks, Brady got used to the pressure of playing before more than 100,000 fans in college. Then, in just his third pro start more than a decade ago, he led the first successful fourth-quarter comeback of his pro career. And last Sunday, cool in the clutch, he got the ball 70 yards from the end zone with no timeouts and 73 seconds left and completed the winning touchdown pass with 5 ticks left on the clock. That 30-27 stunner against the New Orleans Saints added another notch to his comeback belt — 26 wins in games the Patriots trailed in the fourth quarter. Patriots fans who stayed after about half left in despair roared as Brady confidently led his team to victory. But that was nothing like the crowds at Michigan. For some quarterbacks, the moment might be too much. For Brady, trailing in the last two minutes is just another chance to make plays. On his first play after New Orleans went ahead 27-23, Brady threw an interception with 2:16 left. Then the Saints went three-and-out. 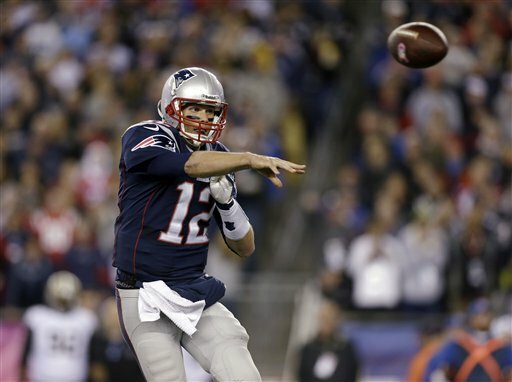 Brady got the ball back and this time he delivered with the winning 17-yard pass to Kenbrell Thompkins. Saints quarterback Drew Brees was worried as he watched. The Patriots (5-1) practice those situations — no timeouts, two minutes left, hurrying to the line of scrimmage. When it happens for real, they’re ready. Next up on Sunday: the New York Jets (3-3), the team Brady beat in overtime last year after trailing 26-23 with 1:37 left in regulation. Perhaps, Jets coach Rex Ryan was asked, Brady is like a vampire whose game-winning drives only can be stopped with a stake to the heart. Brady began pulling the Patriots out of holes three games after an injury to Drew Bledsoe in 2001 made him the starter. In that game, they trailed San Diego 26-19 but had the ball back one play before the two-minute warning. Same as always, even if he doesn’t always win. In the 2012 Super Bowl, the New York Giants went ahead 21-17 with 57 seconds remaining. Brady then completed two of seven passes with a sack before time expired. “When he first took over for Drew and started to become a regular player, we were in a lot of tight games,” Belichick said. “Some we won, some we lost, but I never felt that there was a sense of panic or discomfort or anything with Tom. In 2002, Brady got his first of three Super Bowl wins, 20-17, after the St. Louis Rams tied it with 1:30 left. A 6-yard completion to Jermaine Wiggins set up Adam Vinatieri’s final-play, 48-yard field goal.